Figure. Asymptomatic linear lesions on the patient’s back. 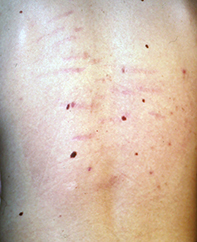 A 14-year-old boy presented with several asymptomatic linear lesions on his back (Figure). They were noticed recently by his mother when she was assisting him in hospital after an operation that required a general anaesthetic (open reduction of a fracture). The boy had previously been healthy. In the past year, his voice has broken and he has had a growth spurt, gaining 5 cm in height. The lesions are striae (‘stretch marks’), linear scar-like lesions that form in areas of dermal damage where the skin has been stretched. When they first develop, striae are usually erythematous and sometimes irritable and raised, but over time the scars fade and become white. This patient’s lesions are adolescent striae, which are a normal pubertal phenomenon and had developed gradually during his growth spurt. They can develop at any time during pubertal growth after the appearance of pubic hair. In boys, it is not uncommon for striae to occur on the buttocks and in a horizontal pattern on the back. In girls, the most common sites are the outer aspects of the thighs, buttocks and breasts. The linear appearance of the lesions is striking and may lead to suspicion of injury (either iatrogenic or abusive). The boy’s mother, who had last seen him undressed over two years ago, queried whether he may have been ‘burned’ during his operation. However, there would be nothing in an operating theatre that would produce striae. Striae can also develop in pregnancy, most commonly on the abdominal wall and the breasts, although not all women develop the lesions and individual susceptibility is variable. Striae may also be seen in obese patients. Cushing’s syndrome. Striae may be a feature of Cushing’s syndrome, in which there is hypersecretion of glucocorticoid of either pituitary or adrenal origin. The striae tend to be widely distributed, occurring on unusual places such as the legs and face. Other clinical features of Cushing’s syndrome include truncal obesity with a ‘buffalo hump’, facial fullness and plethora, bruising, telangiectasia and hirsutism. Complication of corticosteroid therapy. There is a great deal of adverse publicity regarding topical corticosteroid therapy, mainly concerning ‘thinning the skin’, but striae are a rare complication of such treatment that usually only occurs when potent topical corticosteroid is used in the flexures or under a plastic wrap. However, some patients treated with oral corticosteroids, even at a moderate dose, may develop striae that are similar to those seen in Cushing’s syndrome. Marfan syndrome and Ehlers–Danlos syndrome. These are rare genetic disorders in which an abnormality of connective tissue is associated with joint hypermobility and cutaneous changes such as striae. The majority of patients with striae do not have one of these syndromes, which only need to be considered where there is a marfanoid habitus (armspan greater than the height of the individual, joint laxity, arachnodactyly) or obvious and marked joint hypermobility. The first step in management of adolescent striae is to provide reassurance that these lesions are normal and will fade with time. It may be necessary to explain, as it was in this case, that the lesions are not the result of any sort of injury. Topical tretinoin and laser treatment may reduce the redness of early lesions. These lesions generally become inconspicuous after a few years. Associate Professor Fischer is Associate Professor of Dermatology at Sydney Medical School – Northern, University of Sydney, Royal North Shore Hospital, Sydney, NSW. Competing interests: None.